The following is a step by step guide on how to download your Casa Bay Photography images. Please follow the steps below and you will have all your images in your computer in a couple of minutes. ---> Note that this is a shareable gallery. This means that if you would like your social media or marketing person to access the files, we can share the gallery with them and they can download them directly. This makes the process easier and less time consuming for you. 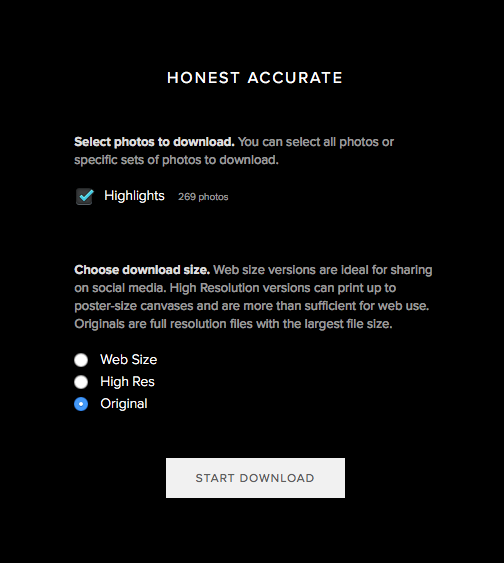 All the information you need to get to your images and download the high resolution files is in the email you received inviting you to your personalized gallery. Just click on the VIEW PHOTOS button. Once you are in your gallery, find the download button. It is the little arrow above all the small thumbnail. Every gallery is private, so sign in with your email address. Also, use the 4-digit PIN provided in your email to authorize the download. In case you are not sure where to find your PIN, go back to the original email. In the bottom of the email there is a grey box with your PIN in it, copy and paste this number. Select the option "Original" when downloading your files. This is the best resolution available, and it is the one your purchased. Once selected click the "START DOWNLOAD" button. This may take a couple of minutes, depending on how many files you have to download. Please be patient and don't close the window. Once your files are ready, it is time to download. Click on the link provided and the images will be automatically saved to the "Downloads" folder in your computer.